The Barabar Hills are home to a group of cave temples which date to the Maurya period or the third century BC. They represent some of the earliest examples of rock-cut architecture in India and were used by Jain monks as a retreat. 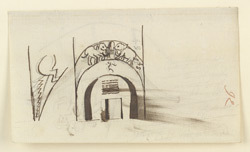 This drawing depicts the entrance to the Lomas Rishi cave which has a very elaborate doorway imitating the elevation of a hut with sloping timber supports, curved eaves and a pot finial. The curved architrave is sculpted with a frieze of elephants proceeding towards stupas. The interior of the cave consists of an oval chamber with a dome roof entered through a rectangular vaulted hall.